Working together for a healthy community. The Thomas Jefferson Health District provides public health services to the residents of the City of Charlottesville, and the counties of Albemarle, Fluvanna, Greene, Louisa, and Nelson. The Thomas Jefferson Health District is one of thirty-five health districts under the Virginia Department of Health. 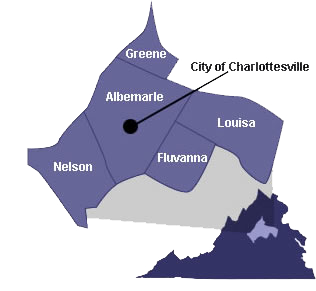 It is comprised of six health departments that serve the counties of Albemarle, Fluvanna, Greene, Louisa, and Nelson, along with the city of Charlottesville. Our local health departments provide numerous services to approximately 244,000 citizens. Find out more by touring our website.